After orgasmic releases on labels like Foundsound, Microcosm, Karloff, Einmaleins and Alphahouse, Miskate (real name Kate Iwanowicz) has made her mark with recent live performances around the world and an inimitable experimental techno sound intricately crafted with found sounds from various sources. Miskate is co-founder of the Foundsound label and a mastermind at making dancefloors blissfully squirm amidst her quirky eccentricity and rhythmic oddities. 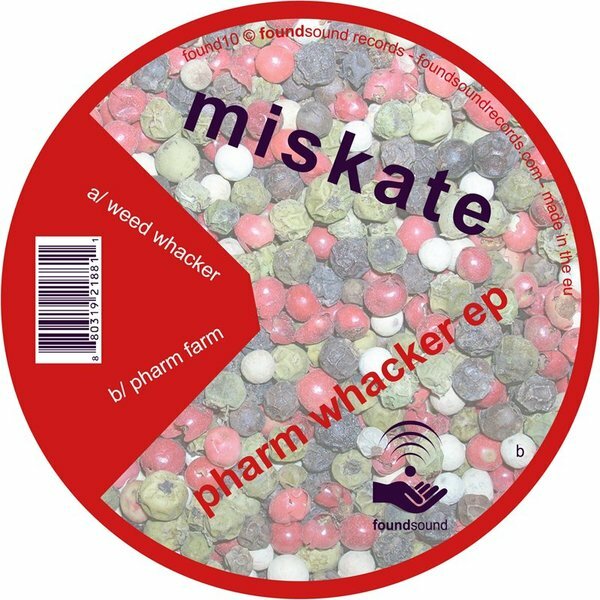 Pharm whacker is an inventive expansion of her playful and psychotropic approach to minimal dance music - ”week whacker" is a long-play burner that aggressively plunges through the speakers maintaining a deep and heady undertone with a relentless dirty synth bassline, hard-hitting rim shots and swinging percussion. But these rhythms drive beneath twisted arrangements of found sounds like gurgling farm animals, whispering voices, buzzing tones, spilling sticks onto a hard floor, crunching dry leaves, scraping hand tools, and other random peculiarities. The breakdown is goofy and remarkably tripped-out. “pharm farm" is another long-player bouncing gently with a subtle deep house vibe through a soft kick drum playfully interwoven with cut up voices, children laughing and shouting, liquids spilling, camels barking, and warm reverbs. Spin this tune as the sun comes up, and watch the people turn the dancefloor into a playground. Miskate is eccentric and above all cool.